Hello Premier League, remember us? Real Madrid are desperate to trim the fat from their bloated squad, if only to help pay for Kaka, Cristiano Ronaldo and whoever else catches their eye this summer. So the Spanish club has earmarked nine players it wants to flog, ideally to needy mid-level Premier League clubs with cash to burn, such as Tottenham and Man City. Six of the nine are Dutch: Ruud van Nistelrooy, Klaas Jan Huntelaar, Rafael van der Vaart, Wes Sneijder, Arjen Robben and Royston Drenthe. The other three are Gabriel Heinze, Javier Saviola (both Argentine) and Mahamadou Diarra (from Mali, and not to be confused with namesake Lassana, who Madrid want to keep). 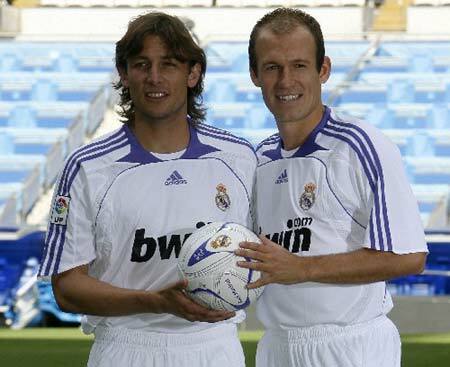 For reasons unknown, Madrid insists on keeping “local heroes” Raul (past-it) and Guti (not good enough in the first place). So where could these nine players end up? Presuming all of them do find a home, I imagine that most of them will probably end up in the Premier League. Ruud van Nistelrooy to Tottenham The media says Arry Redknapp is interested, at the right price of course (Â£2m? ), but Spurs would be taking a risk on the Dutchman’s age and fitness. Still, if RvN can get fully fit, he’d be a much better option that either Darren Bent or Roman Pavlymissalot. Klaas Jan Huntelaar to Man Utd I can see this, especially if United miss out on Benzema. Could Huntelaar be the new Solskjaer? Would he be happy to spend that much time on the bench? If Huntelaar doesn’t go to United, Liverpool and Chelsea could wade in. Rafael van der Vaart to stay Probably too inconsistent to attract the attentions of the big four, but someone like Aston Villa or Everton might take a chance. That said, VdV has said he wants to stay and I predict he will stay. Wes Sneijder to stay The new David Bentley, only much better and with a more amusing accent? Possibly, but again, I think he’ll end up staying. Would fit in well at Arsenal, I think, not that he’s the sort of player at the top of Arsenal’s shopping list. Arjen Robben to Man City A match made in heaven. Robben will go for the money, do well for a few games then break down in October. Royston Drenthe to Serie A Talented young player who hasn’t settled in Spain. Has been linked with Fiorentina. He feels more “Juventusy” to me. Gabriel Heinze to Liverpool Madrid would like to sell Heinze to Rafa Benitez, but I’m not sure Rafa wants him now. Whenever I watch him play, Heinze looks way off the pace and a shadow of the player who was a cult hero at Old Trafford (before the first Liverpool saga, that is). I could see Heinze moving to any of Europe’s major leagues, or indeed staying in Spain but moving to somewhere like Villarreal. Javier Saviola to Liverpool More likely to end up at Anfield than Heinze, I think. A deal worth around Â£5m has been discussed by the two clubs, tabloid reports claim. I’m sceptical -Â Saviola might link up well with Nando Torres, but he doesn’t feel like a Benitez player. Mahamadou Diarra to anyone who’ll take him The Mali midfielder’s knee injury kept him out of action last season, with Lassana Diarra taking his squad number. Mahamadou’s stock is at an all-time low and he could be snapped up on the cheap. Diarra’s agent has played down a move to Juventus. I doubt very much that Madrid will get rid of all nine, but it will be interesting to see who goes where. Are they really gonna sell Ruuud? I thought he was offered a life contact or something. Drenthe to Juve? Please no. We don’t need him at all. Actually Raul is set to leave to Milan, so CR9 can get his real number back. Yeah, I think Drenthe has talent. Real have not seen anything like the best of him. Drenthe does have talent, but he isn’t a 13m leftback. VDV is easily the most talented of the lot, give him a place as Central AM, and he will give assists and score for fun. I’d love to see Moyes snap up VdV, if we could afford him. He has been inconsistent for Madrid but then he’s never been given a really decent run in the side. First choice I’m sure he’d be top quality in the Premier league.